Gingrich and Forstchen's now critically acclaimed approach, which they term 'active history,' examines how a change in but one decision might have profoundly altered American history. In Pearl Harbor they explored how history might have been changed if Admiral Yamamoto had directly led the attack on that fateful day, instead of remaining in Japan. Building on that promise, Days of Infamy starts minutes after the close of Pearl Harbor, as both sides react to the monumental events triggered by the presence of Admiral Yamamoto. In direct command of the six carriers of the attacking fleet, Yamamoto decides to launch a fateful 'third-wave attack' on the island of Oahu, and then keeps his fleet in the area to hunt down the surviving American aircraft carriers, which by luck and fate were not anchored in the harbor on that day. from President Roosevelt, Prime Minister Churchill, and the two great admirals, on down to American pilots flying antiquated aircraft, bravely facing the vastly superior Imperial Japanese Navy aircraft. 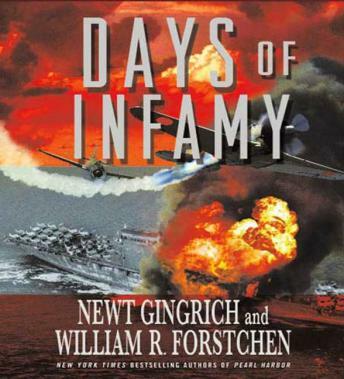 Gingrich and Forstchen have written a sequel that's as much a homage to the survivors of the real Pearl Harbor attack as it is an imaginative and thrilling take on America's entry into World War II.